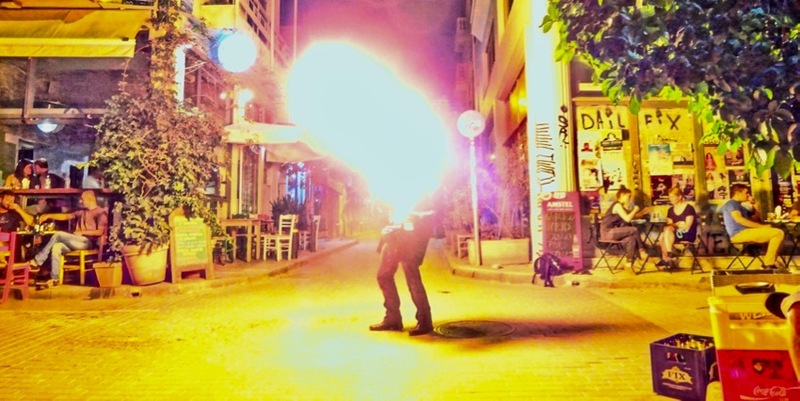 Plaka is fun for your parents but if you are of partying age Psiri and Gazi are the places to be. 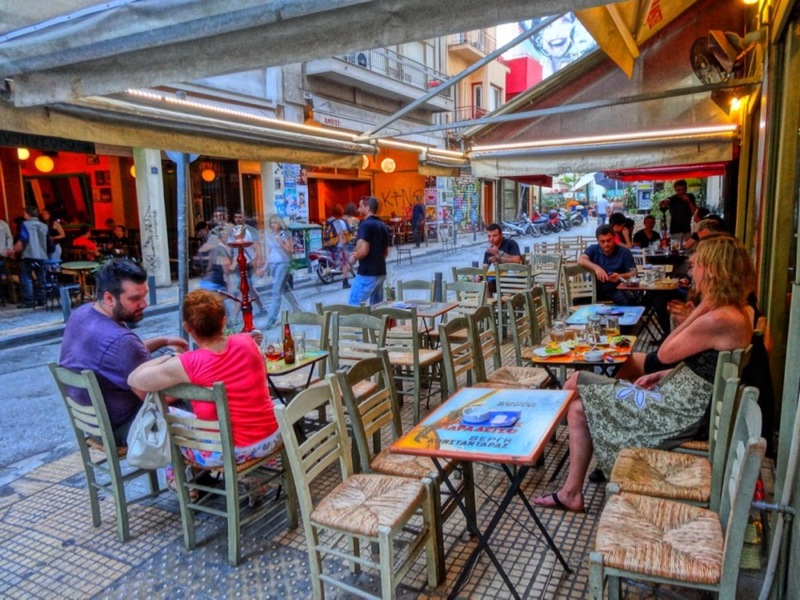 Psiri does not have the carefree Never On Sunday feel that the Plaka has. It is sort of a dark place that echos its underworld past. But if you want good food and nightlife there is no area as authentically Greek as Psiri, or as international. Psiri has always had a reputation of being anti-establishment. From the very beginning of the modern Greek State people from the provinces and especially from the island of Naxos, came to the area of Psiri. Many got jobs and became respectable citizens but some stayed and made up the underworld of Athens. They were known as mangas. Hash-smokers, petty criminals and people discontent with society their ranks were constantly replenished by new immigrants. One group called Koutsavakideswere known for their long mustaches, long sharp toed boots with high heels, tight pants, a broad sash which hid their weapons and their jackets worn with one arm out of the sleeve. They terrorized Athens using Psiri as their base for over 50 years. They literally governed the neighborhood and even the police were afraid to set foot in Psiri. Sort of like the way Exarchia is now. In 1893 Prime Minister Harilaos Trikoupis founded a new combination army-police to stamp out the Koutsavakides under the control of the tough Inspector Dimitrios Baoraktaris. His method was simple. He humiliated the Koutsavakides by arresting them and cutting off the toes of their pointed boots as well as the unused sleeve of their coats, shaved their mustaches and force them to break their guns, before sending them home embarrassed. It worked and the Koutsavakides faded away and Psiri became safe for everyone. Unfortunately Baoraktaris did not stop there. He also ended the romantic custom of suitors serenading from the streets to their beloved in the windows and balcony above, by sending his police to break the guitars over their heads before arresting them and throwing them in jail for the evening. Psiri was also known as the haven for the revolutionaries during the war of Independence as well as for a very odd sport that kept the lower classes entertained in the days before football. They would have 'stone wars' or what we as kids called 'rock fights'. At a prearranged time men from Psiri would meet the men from Thission, Metaxourgio or Petralona and insult each other until the rocks began flying. There were cheering spectators and those injured became neighborhood heroes. This went on until the end of the 19th century. Give oh give me back my heart"
The subject of this poem who became something of a star was Theresa Makris, one of three sisters who lived next door to the boarding house where Byron stayed when he visited Athens in 1809. Though Byron never had a relationship with her (she was only twelve and he preferred the company of young boys) the mere mention of her in the poem inspired a sort of cult and nineteenth century tourists would visit the house and hope to witness the beauty that had inspired the great romantic poet. The house where Byron stayed was on the corner of Agios Theklas and Papanikolis street. Its just up the street where Stavros Melissinos the famous poet-sandal-maker of Athens has his shop. During the 20th century Psiri was an area of tavernas and a place where you would find the rembetica musicians who sang their songs of love, exile, pain, poverty, heroin and hashish, the same songs you will hear in Psiri today. Psiri is my home when I am in Athens. Several years ago a wealthy landlord (who happened to be a government minister) was able to pass a law that made Psiri, a working class neighborhood that was full of leather workshops and small factories, into an area designated for nightlife. This of course would make real estate more valuable. The leather workers who had been there for generations were not too pleased, but the result was a neighborhood that was suddenly alive, not just during the day but all night too. Whether this is something positive or something that will one day lead to more misery (alcoholism, obesity, decadence and high rents) we will have to see but for now one thing is certain: Psiri is a fun place to visit and I would not mind living here either. In fact when I am in Athens I sort of do live here. Walking through Psiri in the daytime is deceiving. The streets are filled with working class people and the former leather craftsman district still contains a variety of shops and businesses that might be described as practical or business oriented, from type-setters, to fixtures, and material goods for making clothing. The only clues that the area is a hotbed of nightlife are the cafes and restaurants storefronts that look like they have been closed for years and the new shops and boutiques. If you were wandering through the neighborhood you might stop and wonder what a state-of-the-art climate-controlled shop selling Cuban Cigars is doing in an area of workshops and small factories? If you took an early morning stroll through the area and did not look close enough to see the signs that advertise them as restaurants you might think they are abandonedor not even notice them. 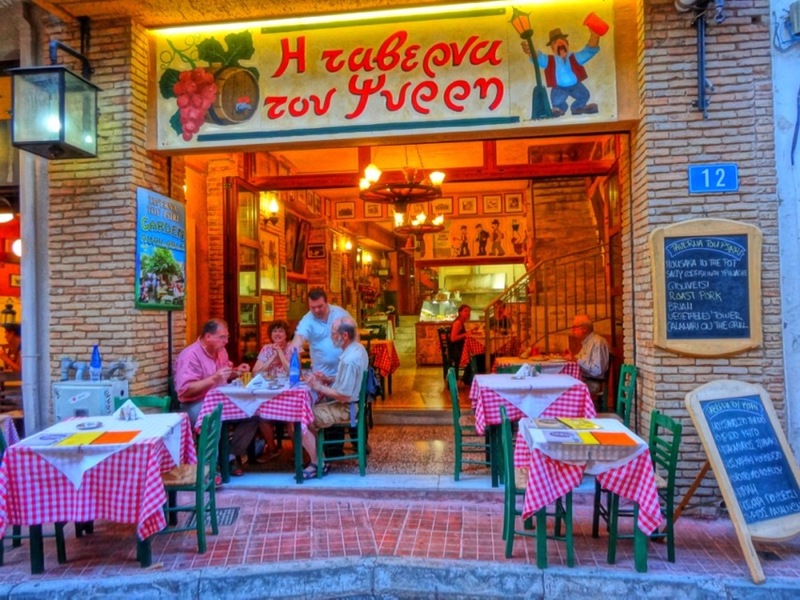 But as the morning progresses and the owners arrive, cafes, restaurants, souvlaki shops, ouzeries and bars begin to open and by afternoon the neighborhood is buzzing with the sound of music and conversation. Psiri undergoes the transformation from working-class-light-industrial, to a food and entertainment mecca that reminds me of a scaled down version of New York's Soho district with the East Village tossed in. The streets are filled with tables and chairs and what were parking lots during the day become dramatically lighted outdoor dining areas for restaurants that look they have been built into a bombed out city. 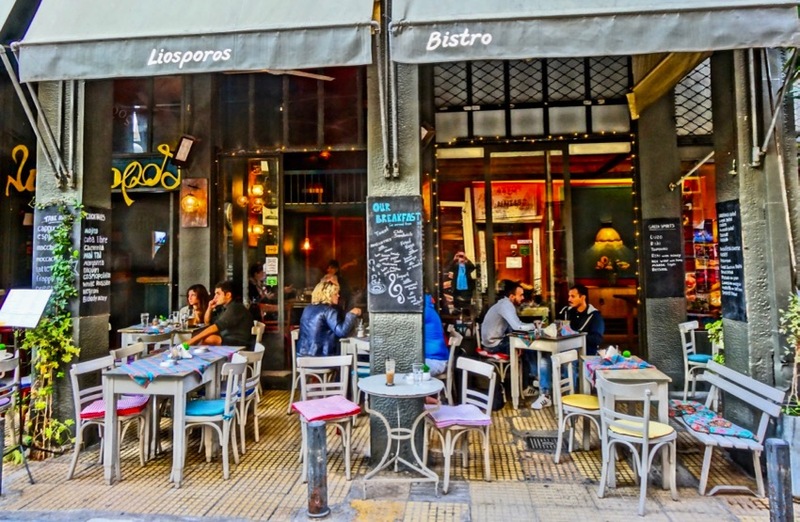 Each restaurant has its own style, from traditional Greek taverna or ouzerie-mezedopouleon to 60's style cafes that may remind you of a luncheonette in an old movie. Many are decorated with historic photos of Athens and some with relics of our modern society. If you are coming from Athinas Street or Ermou and you are on Maoulis Street one of the first of these cafeneons you will come to is Arodou on the corner of Protogenous Street. Nice salads and mezedes in more of a hip punk atmosphere than traditional Greek. 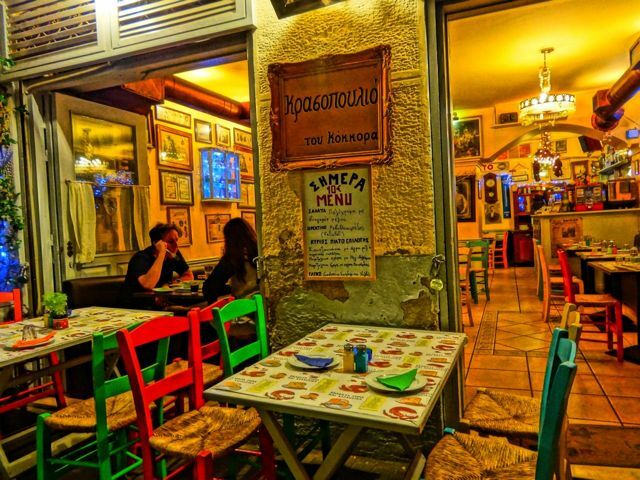 The Liosporos Bistro on Maoulis Street right at Iroon Square is a small sophisticated cafe-ouzeri, playing jazz and swing rather than the old Rembetika songs played in some of the other places in Psiri, and the mezedes (snacks) they serve with their ouzo and tsipuro are delicious. They also have salads, pastas and breakfast. Some places in Psiri have a look that seems to say "If you are a tourist-please go away", but you will find the service very friendly and if they did not want you there they would not have printed the menus in English or have waiters who speak English in the places that don't have menus. Right across the street, on the square is Beer-time, one of the few places in Athens where you can get Greek microbrew beers as well as beers from all over the world served in a variety of styles including mini-kegs that sit on your table. They also have all sorts of food, the kind that goes with beer. They share Platia Iroon Square with the two desert restaurants. One is a traditional bougatsa shop called Boudatzidiko stou Psyri, serving sweet, fruity, syrupy, cheese and sweet filled pastries that originate in Thessaloniki as well as loukoumades, deep fried dough covered in honey or syrup. Next door is a fancy pastry shop called Nancy's Sweet Home Glykopouleio where people stand in line to eat enormous portions of pastries topped with icecream. Further into Psiri on tiny Ivi Street is the mezedopoulion Cafe Ivi (or what we call The Elvis Costello Place because the owner, Stratos, bears an amazing resemblance to Elvis Costello). It is very small and there are very few chairs and for that reason I am not going to give directions so that only the more adventurous will find it. Ivi carries Baba Tzim ouzo from Serres, one of my favorites as well as dozens of other ouzos from Lesvos and tsipuro from all over Greece. This is where I am most nights in Athens, starting off with an ouzo or two, some fried shrimp, or grilled soupia (cuttlefish), hummus, sausages, the marinated fish plate which features rega, skoumbri, sardeles and other fishy things that go great with ouzo or raki. We hang out for hours and maybe order a few more dishes before Andrea goes back to the hotel to read and my friends and I continue throughout the night. It is mostly young intellectuals and a few knowledgeable X-pats, and a great place to make friends. 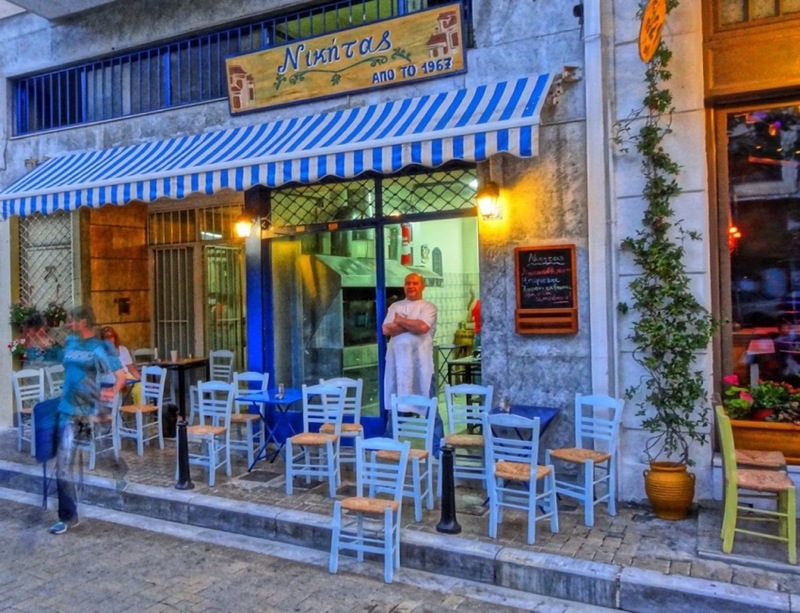 Right around the corner in a narrow street that is more like an alley is Atlantiko which is similar to Cafe Evi with even more focus on inexpensive fish. This is another of my favorite restaurants in Athens, and it is right across the street... well, alley from Polis Hammam, the new Turkish Baths at 6-8 Avliton Street. 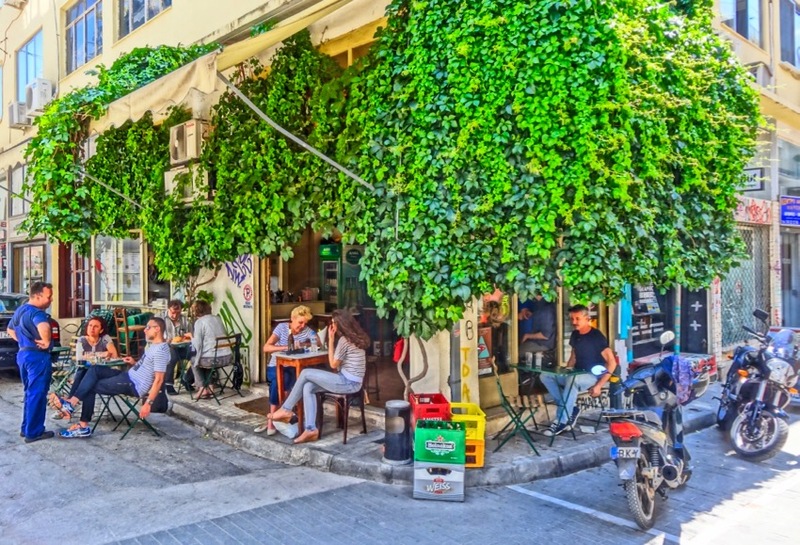 My favorite winter places are Taverna Psiri and Oinopouleio (photo) which are right next to each other on Aisxylou Street which is one of 2 streets that extend from the opposite side of Iroon Square from Miaoulis and Kariaskakis Streets. Both have excellent food, live music some nights, and a garden in the back for good weather which is much of the year. Oinopouleion is owned by Markos Winery and have excellent bottled and barrel wine. I especially recommend their retsina. Order the meat platter at either of these restaurants and you should be very happy. Right next door to these 2 restaurants is a psistaria (Grill House) called Odos Aisxylou at #14-16 and they have lots of grilled meats and some nice salads too in case you can't get a table at the other two. The zacharoplasteion (sweet shop) across the street is one of the first to open in Psiri and one of the most popular in Athens. If you walk from the square up Agion Anargyron street to the next square there are two or three more ouzeries. Nikitas opposite the church is as reliable, friendly and cheap as any you will find in Athens. One of the last such in Psyrri. Nikitas calls itself a psitopol�o but they�re really a proper oinomayerio, always with several dishes of the day. Their biftekia aren�t bad either. They usual have a good eggplant dish on offer. The outdoor tables are much in demand in fine weather. They are open all day and into the evening. Krasopoulio tou Kokora is one of the oldest restaurants in Psiri, one of the first five or six that opened in the nineties and the restaurant space itself used to be an historic music taverna, dating back to the mid nineteenth century. It is a small cozy restaurant with outdoor seating and the inside looks like a museum, full of antiques and old advertisements. The food is excellent and inexpensive. For meat eaters try the meat pikilea which for 17 euros will easily feed two people, three if you order an appetiser or one of their giant salads. To find it just walk from Iroon Square down Giorgiou Kariaskaki Street and take your second right. A few steps further and you will come to Gostigo which is the only kosher restaurant in Athens. Keep walking and you will come to a small ice-cream shop, the former Gelatomania, now in a more subdued location but still selling their amazing Italian ice-cream which always tastes better after a night of eating and drinking. 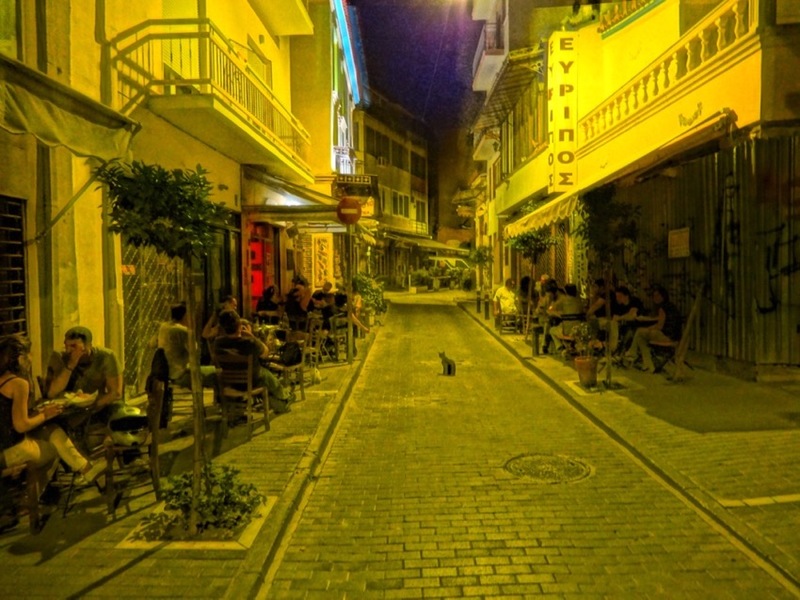 If you continue on to Takis Street and make a left you will come to a small hole-in-the-wall ouzeri with very good food, called Mavros Gatos which means Black Cat. Great place for ouzo or tsipuro and meze with friendly waiter/owners and an underworld atmosphere you will brag to your friends about. Try their regasalata (herring salad), keftedes (meat balls), gavros marinatos, potato salad and other small plates from their menu. By the way I did not get that black cat to pose in front of the restaurant, nor is it a plastic cat or photo-shopped. When I took the photo a black cat just happened to be sitting in front of the restaurant called the Black Cat, one of those strange occurrences that makes one believe in intelligent design or the Matrix. Be aware that when you enter Psiri, your first instinct will be to think "This can't be the place". 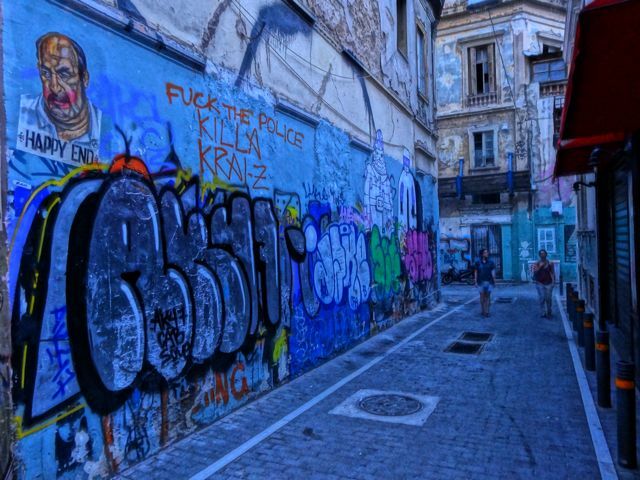 The area seems dangerous and dark, with loads of graffiti, some of it quite ominious. But it is not dangerous and graffiti can't jump off the walls and bite you so be brave and continue on. As you follow the small streets towards the center it gets livelier and more well lit until suddenly you realize you are here. 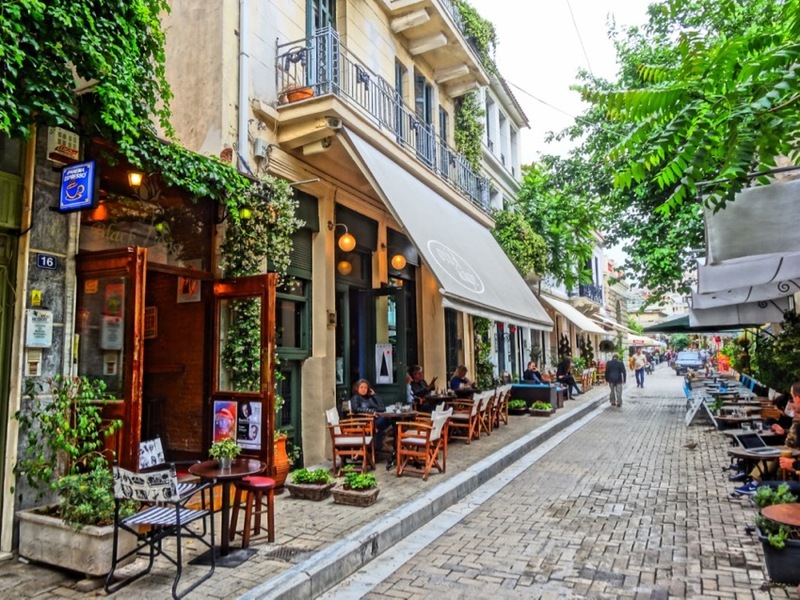 The easiest way to enter Psiri is on Protogenous street one of the small roads between the Attalos Hotel and Monastiraki Square on Athinas street. Walk in and you will pass several cool cafes on the way to Iroon square. The street ends at Miaoulis Street and if you take a right you will be in Platia Iroon (Hero Square) the center of Psiri. If you are coming down Ermou pass Monastiraki Square and turn right on Themidos (turns into Miaoulis) or Kariaskaki and both will lead you to Iroon Square.I used to say that the best time to be here is during Apokreas, Greece's Carnival Season when the streets are packed with people in costume and the night goes on forever. But in the last few years it seems like the best time to be here is anytime. Psiri on a weekend afternon or night may cause you to ask the question: Crisis? What crisis? There are numerous cafes and restaurants open every day, and there are very few cars to bother because even though the streets are not officially designated as pedestrian, trying to drive in here is a nightmare and most intelligent people avoid it, either coming by metro (Monastiraki Station is right here), or taxi. You should keep plenty of change on hand because the street musicians and the girls selling flowers come in a never-ending parade and the more you drink the harder it is to say no. 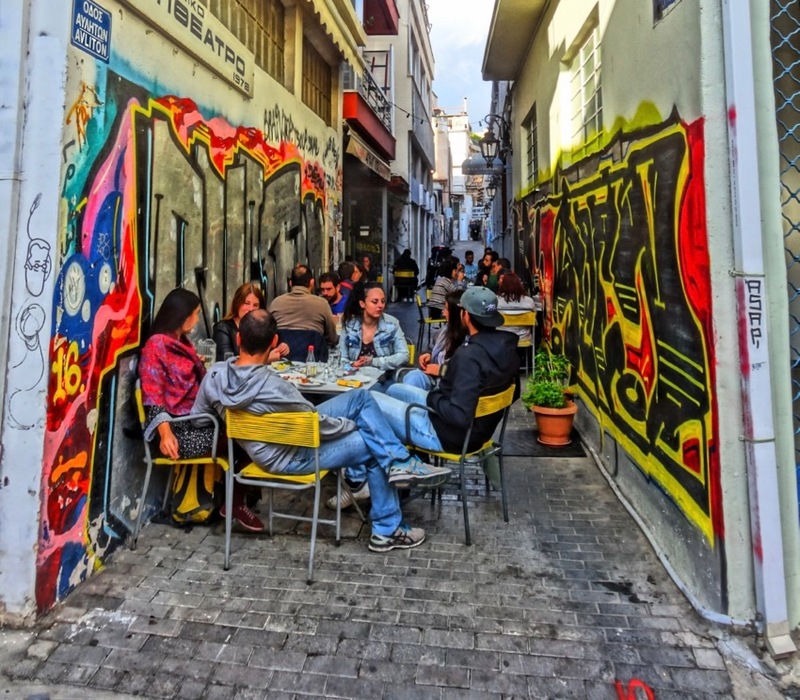 There are also many new galleries and theaters in this district and the bordering former gasworks area known as Gazi, as well as in Metaxourgeio too. These neighborhoods are for the explorers. 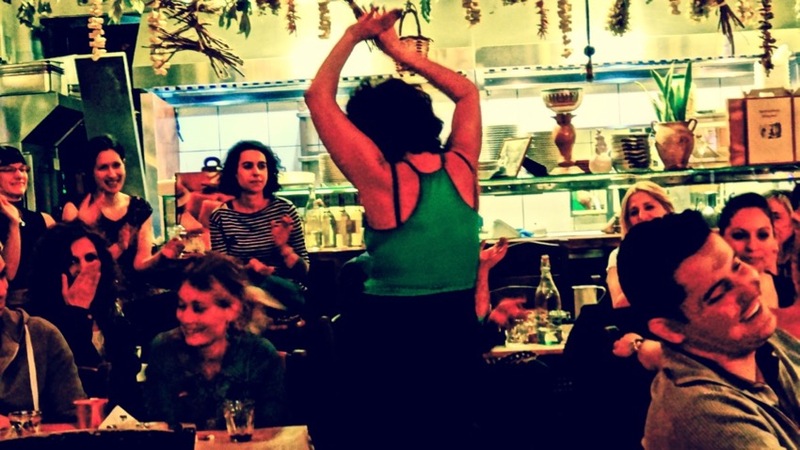 Those who have tired of endless T-shirt shops and mousaka signs and being danced to by men in evzone costumes while you drink domestika and look at a room full of people as foreign as you, Psiri is the place to go. This area is for people who want to see what it is like to be young and hip and hang out in Athens. Or even not so young and hip. One of my favorite places in Psiri is a small bar called The Party, named for the great Peter Seller's comedy, at 31 Kariaskakis Street, which has live rock and pop music just about every night of the week and on Wednesday nights there is a live jazz jam that goes on well into the morning hours. 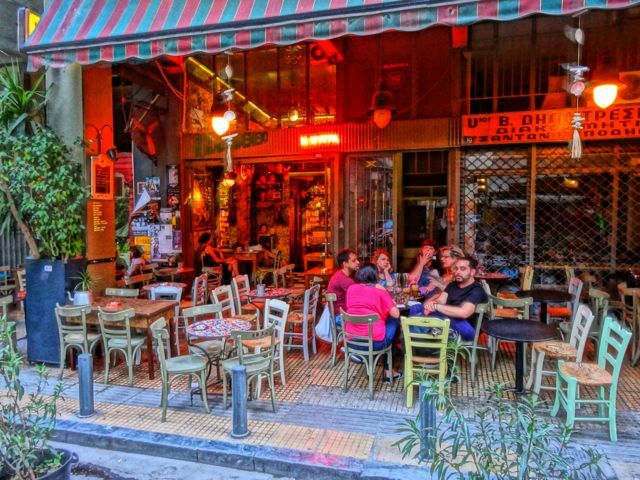 Very easy to find, just half a block from Iroon Square, this is one of the first bars in Psiri and attracts a mixed crowd of young and middle aged Greeks and a handful of foreigners. During the jazz jam the bar is filled with musicians and there may be as many as 5 or 6 horn players on the stage at once. 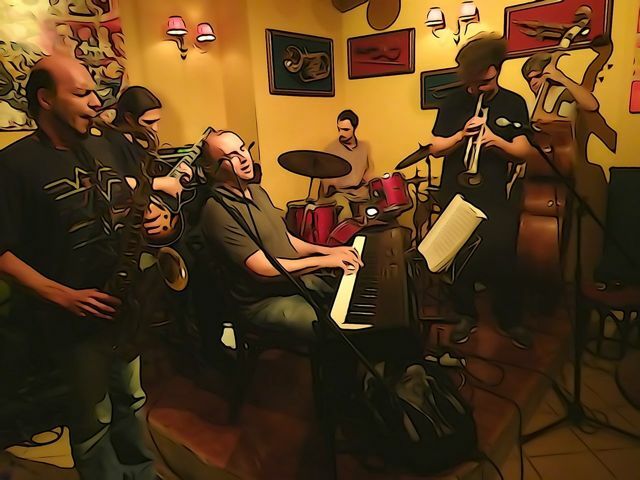 Traveling jazz musicians sometimes do workshops in the early evening which gradually lead into the open jazz jam. In the daytime they have coffee, beer, wine and snacks and play Frank Sinatra, New Orleans Jazz and other tasteful things. There are techno-clubs, bars, live music clubs, sixties music bars... and I think you are getting the idea that Psiri is not just a place where people go and drink ouzo and listen to old Rembetika songs all night. Psiri is an all-ages party and it is not uncommon for there to be a traffic jam on Athinas street at 5am on a big weekend. Another nice spot is Therion, just off Takis street if you are about my age and are turned off by the music you hear in most clubs these days. Its for a more mature crowd though youngsters with good taste hang out there as well. Be warned that like most bars and clubs it is smokey and you may want to put your clothes on the balcony of your hotel when you get home or your whole room will smell of cigarettes when you wake up. 7-Times Club at 13 Maiouli Street right by the Monastiraki Metro Station in Psiri plays international music, a mix of live and DJ. Their house band plays everything from Elvis to Depeche Mode and you can hear anything from rock and roll, to swing, different varieties of jazz, pop, funk, bozza-nova, sixties and even Irish music on St Patrick's day. 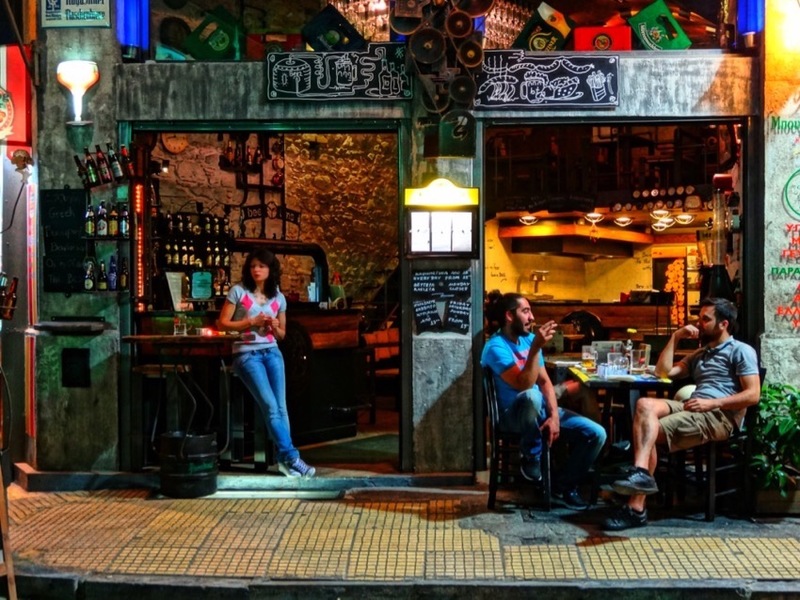 Barrett Bar on Protogenous street is one of the most popular hip places in Athens. No, it is not named after me. Right next door is Syd Records, owned by the same people. Keep in mind that the nightlife does not end at the borders of Psiri. If you have a drink at Barrett Bar, walk up Protogeneous Street and cross Athinas Street and wander wround you will find the famous 6 D.O.G.S. 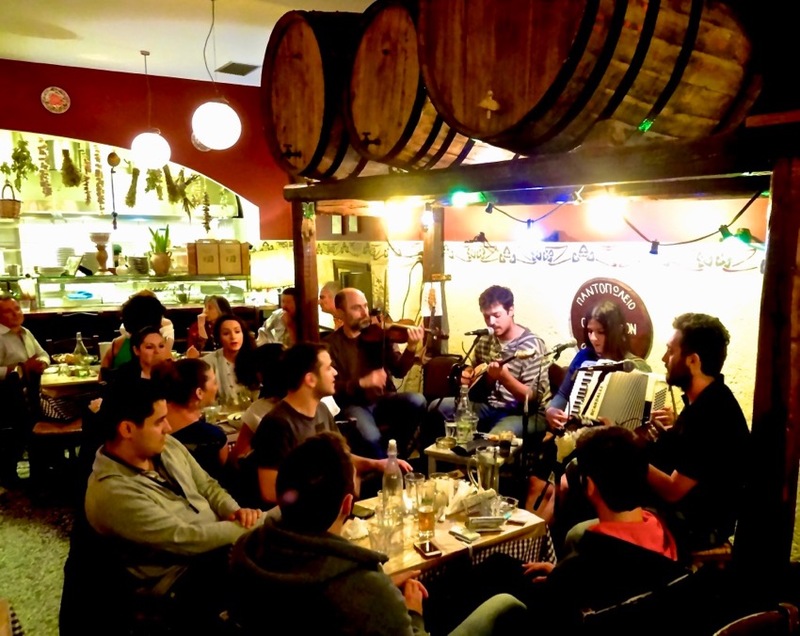 complex, a series of bars, some with live music and a number of other cool hangouts including the cafes and bars at Agia Irini Square. I would not be doing my job if I did not mention Little Kook Cafe on Kariaskakis Street. But even if I didn't it is impossible to miss. It has a guilded carriage outside, a giant dragon on the roof, gargoyles and all sorts of fairy tale objects inside and out. And it is one of the few places that actually enforces the no-smoking laws. If you walk down Agia Anargiron from the square and you will come to a quiet area of small cafes away from the main drag. This is a nice place to come for breakfast or to hang out and read the news and answer e-mail. All the cafes have free wireless. In fact just about every place in Psiri does. This end of the street is generally quieter and more low key than the center. However right at the end of the street is Pame Psiri, a popular restaurant that features live laika and rembetika music and dancing. Those who are horrified by the commerciality of the Monastiraki Flea Market will find the small shops of Psiri a breath of fresh air. 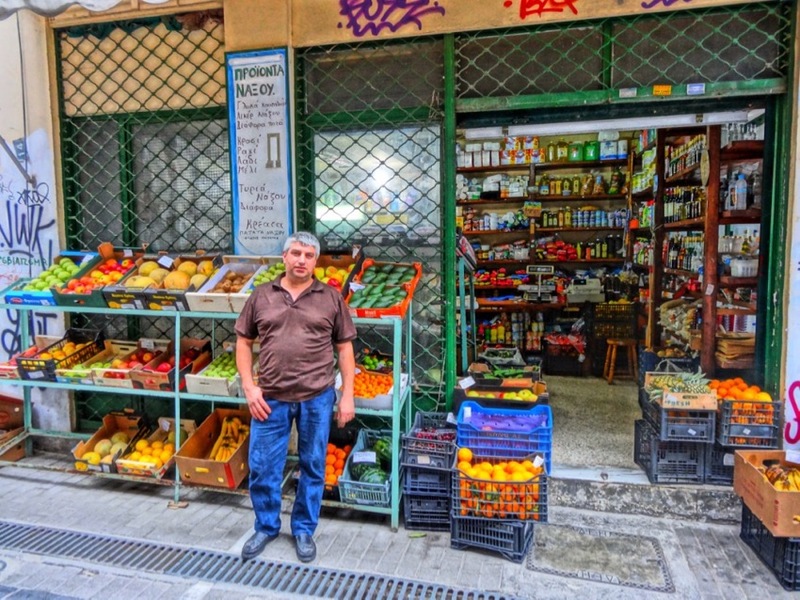 The lower rents have become an invitation to merchants selling unique products not found in the nearby tourist areas of Athens. Starting the week before Easter Sunday Psiri plays host to the Naxos, Lamb and Cheese market. The streets are filled with Naxiotes who have come to Athens to sell the Easter lambs everyone roasts and the delicious Naxos cheese which the island is famous for as well as home made wine, all from the villages in the interior of the island. Read all about the Naxos Lamb and Cheese Market and see also the famous Naxos shop:Geniko Emborio Eklekton Proionton Naxos (photo) where you can buy fruits and vegetables as well as cheese from Naxos that comes in big wheels able to withstand the rigors of transcontinental travel and can last up to a year in the fridge, a perfect gift for yourself or that special someone. It may be the best cheese you have ever eaten. Stavros Melissinos, the famous Poet-Sandalmaker has moved to Psiri at #2 Ag Theklas Street and instantly livened up the street. 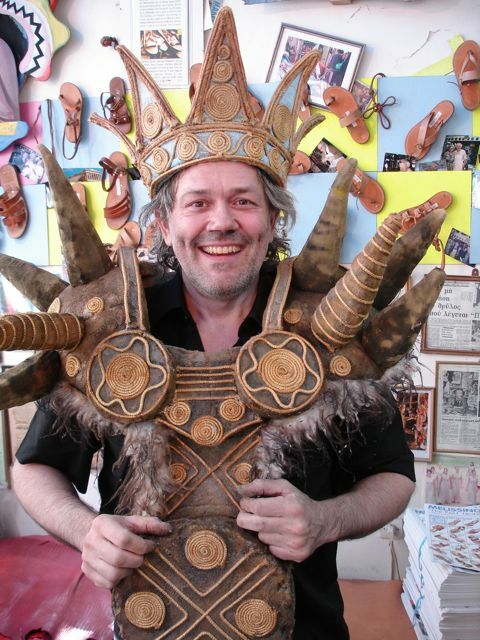 His son Pandelis is now running the shop and may be the most over-qualified sandal-maker in the world with a degree from Parsons School of Design. He is also a poet, painter, musician, playwright and costume designer and his shop has played host to everyone from the Beatles to Sophia Loren, Jackie Onassis, Brigitte Baku, and Lily Tomlin. The shop is usually full of people being personally fitted for sandals, sharing travel stories and being entertained by Melissinos and his crew. Melissinos himself is a fountain of information about Greek politics and history and a visit here may be one of the most educational experiences you have during your visit to Greece. When journalists ask me who they can talk to about the situation in Greece I send them to Pandelis Melissinos. In Greece if you want to understand politics, ask a poet. Other popular shops in Psiri include the El Habenero Cuban Cigar Shop, right in Iroon square, and they have a large collection of cigars and other smokable things. If you are American keep in mind that it is illegal to bring Cuban cigars into the states and if you try and are caught they will be confiscated and smoked by the Department of Homeland Security. Further down Ag Anargiron street on tiny Nika Street is a shop where bouzoukia, baglamas, aouds and other stringed instruments are handmade. There are all sorts of skateboard, antique, vintage clothing and other eclectic shops in Psiri if you just wander around with your eyes open. Across the street is To Pazaati (The Bazaar) which has beads, jewelry and all sorts of cool hippy stuff. Also look for the Komboloi Museum, a colorful store on Ag Anargiron street just a block west of Iroon Square where you can buy real worry beads like the old Greek men use and not the plastic ones that they make for the tourists. Remember Fashions was the first punk-fashion store in Greece and an institution. 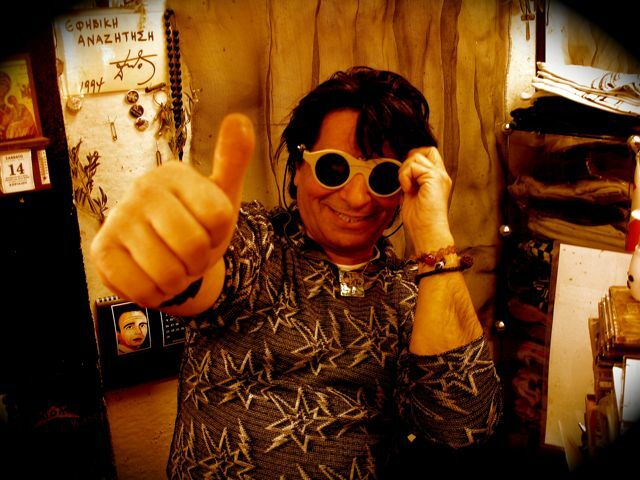 Run by designer Dimitris Tsounatos (photo) this boutique has been visited by your favorite rock stars, actors, fashion designers and models and there is a photo album full of them to prove it. If you are looking for unique designs in clothes, jewelry and art, or if you just want to see something different from the tourist shops that line Adrianou then stop in at Eschilou 28, (right across Iroon Square from Beer Time). You may find your favorite band in an original design or you may find an original design that is so unique you will have to have it like the one I bought that I am not permitted to wear because my wife says it draws attention to me and makes me look like a giant graffiti covered pumpkin. I don't let my wife tell me what I can and can't buy. Unfortunately she won't let me wear it out of the house. I am thinking of just having it framed. Visit Dimitris. He is a classic character of a bygone age and punk lives on in his shop. Heavy-metal too. In fact when all the punk and heavy metal bands come to play Athens they head straight for Remember so you may run into one of your heroes. 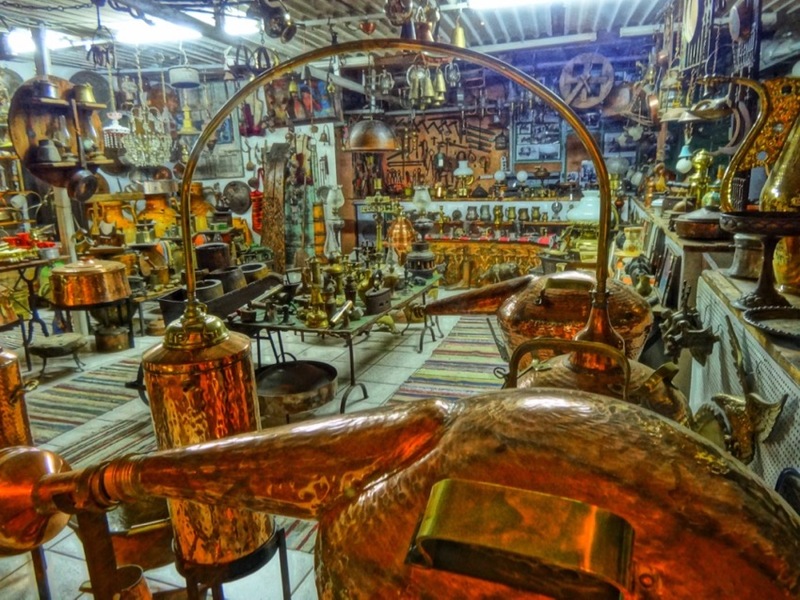 Check out the shop that makes all kinds of copper pots and pans and things on Navarchou Apostoli street where you can even buy your own still for making ouzo and tsipuro at the Ergastiria Liakis Technis (Workshop of Popular Crafts). For those who come to Greece to collect rare vinyl records that you may not find in your home country there is a small record shop that is not easy to find, but once you do you probably won't leave there without several old treasures. 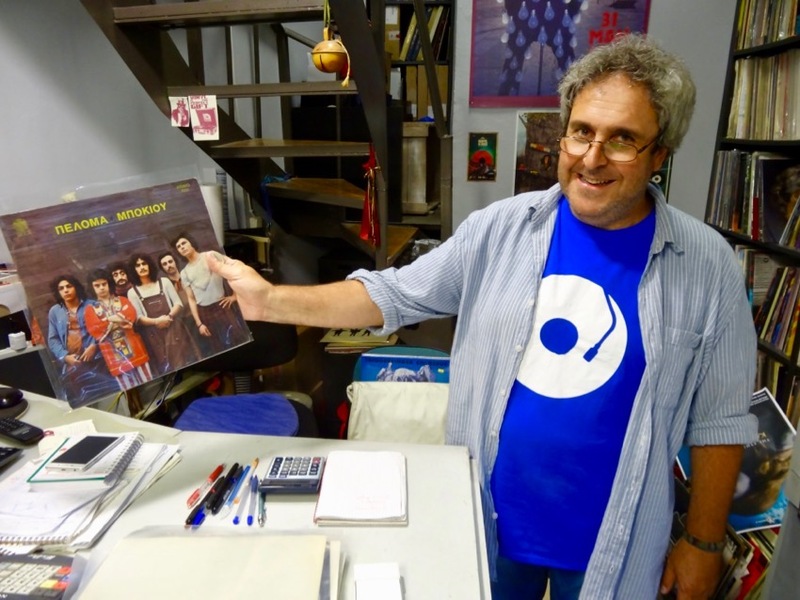 Diskadiko is owned by Iosef Aggelidis, a long time fan of the Greek and International music scene and a passionate collector of albums, art and music paraphenalia. He can also tell you the history of the Greek music scene because he was a part of it. To find the shop you can walk down Protogenous Street and look for his sign on the street which tells you he is open. Or take a left on Agios Eleoysis Street. If you are coming from Ermou Street just take a right on Miaoyli Street and again look for his sign, or turn right on the street in front of the metro entrance. If that fails you can call him (210 698-3804) or e-mail him. You can also visit his website. 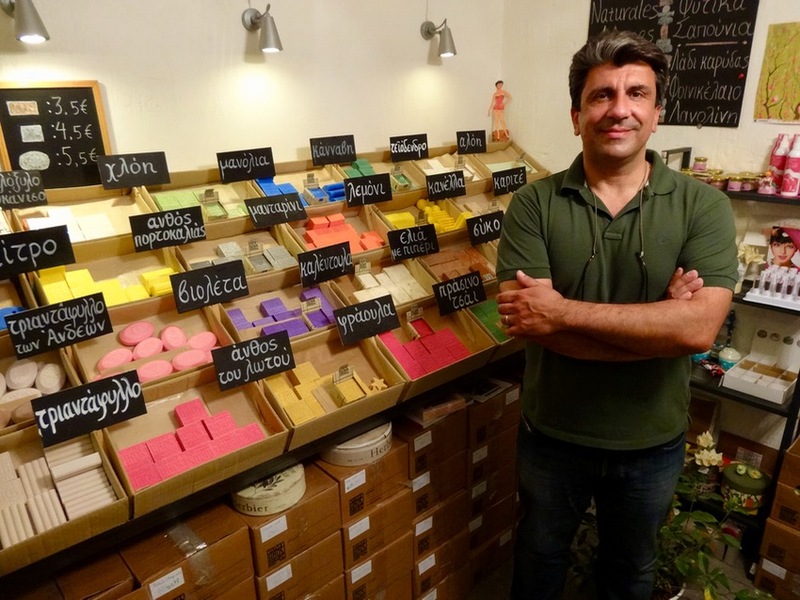 Finally there is an amazing soap shop at 19 Taki Street, with a name you will remember: Boubouki, because it rhymes with..... well, never mind. But it has some of the best smelling natural soaps and beauty products in a very colorful setting. I bought the cannabis soap and have been taking several showers a day ever since. (Everytime I walk past the patrol cars parked at my local police station the drug-sniffing dogs go crazy) We also bought lavender, and a few others, all of which smell wonderful and will make people fall in love with you. Yiannis the owner is also the owner of the Krassopouleio tou Kokoras, one of my favorite restaurants in Psiri which is mentioned above. 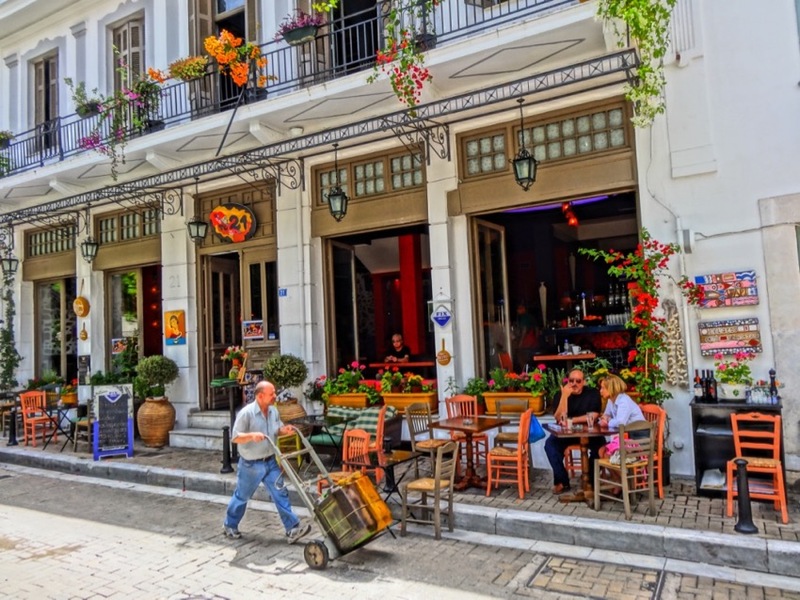 The nearby Attalos Hotel on Athinas street is clean, very professionally run and very inexpensive and by staying here you have access to Psiri as well as Monastiraki, the Plaka and all the archaeological sites. Also nearby is the boutique hotel A for Athens which has the best rooftop bar in the city with an amazing view. For backbackers and budget travelers the Athens Style Hotel-Pension, City Circus and Acropolis Hostel are your best bet and both are right in the heart of Psiri. 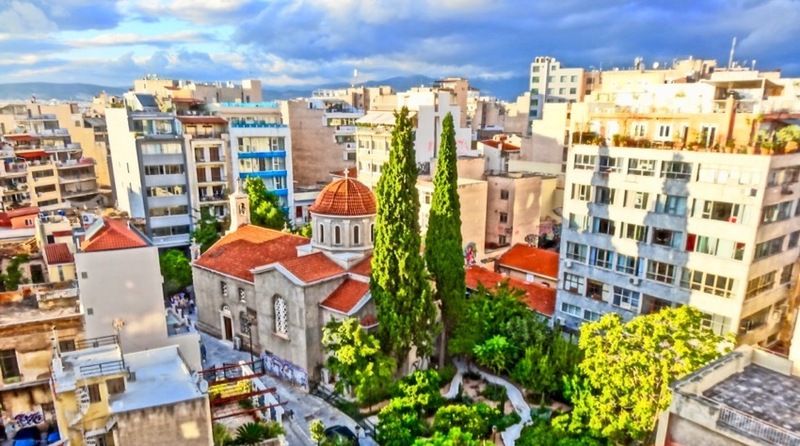 Other hotels and accomodations in Psiri include the modern 3-star Arion Athens Hotel which is on Agios Dimitris Street right by some of my favorite Psiri restaurants and a few steps from Athinas Street. The 3-star 360Degrees Pop Art Hotel offers modern accommodation with free WiFi access right on action packed Miaoulis Street and just steps from Ermou Street. Their sister hotel, the famous 360 Degrees Hotel, is right across Ermou Street in Monastiraki Square. Live in Athens offers modernly decorated, self-catering apartments with free WiFi. The newly rennovated 4-star Lotus Inn is right on Ermou on the edge of Psiri and Monastiraki. The Hotel Cecil is an historical economy hotel right on Athinas street. Andronis Athens is located in the heart of Psiri on Kariaskaki Street close to everything and is very popular with couples. For more hotels in Psiri use Booking.com's Athens Hotel Search and type in 'Psiri'. Be sure to visit the new Museum of Gastronomy at 13 Agio Dimitriou right by the big unfinshed church down the street from Taverna Psiri.